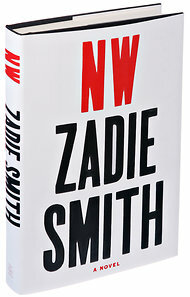 I mentioned on Friday that I didn’t like NW, Zadie Smith’s recent novel about the lives of thirty-somethings who grew up in the council estates of northwest London. (Um, actually, I could be wrong. Still not sure if this is what it was about.) I still don’t like it. And this surprises me! I don’t generally dislike many books I read, even though I read a lot of them. I’ve been trying to think of why this is so often the case. 3. Or it could be that, after years of practice, I’ve gotten very good at picking out the books I’ll probably like (out of all of the books ever published in the English language). Also, I’ve been free of reading lists for a while now, which helps in that I haven’t been forced to read anything I really, really didn’t want to read. I read NW with my book club. the books I’ve tended to like the least or dislike entirely have been books I’ve read with said book club. We choose books by a process of nomination and voting so I think we usually end up with a book that most people are happy to read. However, we’ve discovered recently that the books in the past year that have been almost universally disliked — including NW — have ended up sparking much more interesting conversations than the books we’ve generally liked. Discussing exactly why none of us really liked NW on Monday night made us really pick the book apart. And it made me really think about and verbalize the real reasons I didn’t like it. It wasn’t just that I was bored during certain parts or that I was confused and upset by the ending. I think that I was genuinely disappointed that this book was not the important novel that I imagine Zadie Smith aimed for it to be. And I felt the most hopeful that the novel would succeed when I was connecting with a particular character. For example, during the novel’s second distinct part, in which we spend a day with a doomed man named Felix, I felt invested in that character and was interested in how his story would connect with Leah’s story, which was the first part of the novel. I felt the same way through much of the novel’s third part, which is the story of Natalie’s life told through a series of over one hundred vignettes. But as her story got longer it became more and more disconnected from the first two parts and by the end of it, there weren’t very many pages left to tie everything together, which is where the novel went off the rails and then ended in a spectacularly confusing crash. And now I have no choice but to compare NW to that empty train in Sweden that a cleaning lady recently crashed into an apartment building. Bottom line: Read this book, but only if you want to be disappointed and utterly baffled. But honestly, I think you should all just read or re-read White Teeth instead.